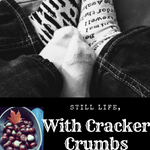 Spring Break Staycation | Still Life, With Cracker Crumbs..
Last week was my son’s spring break from preschool, and for the first time in a very long time, Wyatt and I found ourselves looking at a week that didn’t have any doctor’s appointments, therapy (usually three times a week), school, or even work for me, as my boss (and cousin lol) was on a family trip for their spring break. I had planned at first to work on some potty training for my little CP warrior since we had all week to do it, uninterrupted. But, this kid works so hard, you guys. So hard all the time. So, I changed my mind. I was taking advantage of this wonderful gift of time, and letting Wyatt just be a kid. We spent a lot of time outside – the weather was amazing, spring making its way to the Mitten state, finally! We took lots of walks, had picnics in the yard, ate lots of ice cream, practiced pedaling on the tricycle, and just lots of “play momma, play”. We also went on a “zoofari” together. We picked three animals to go find at the zoo and then went and found them! He picked the zebra and giraffe, I picked the otters, one of my favorites – although Wyatt picked my other favorite, the zebras! He loves the giraffes, and I found out last night that his cousin does too! We planted a few seeds for our garden – moon and star watermelon, cinnamon basil, and lettuce. We were also really excited to find a new friend, a neighborhood groundhog that we have named Stan. He lives under these steps of a church, and is always just hanging out on his porch. We would go check on him everyday, of course hanging back to not disturb him or interfere with him. I even managed to get some adult time in! I had book club with my buddies, and then Billy and I reconnected with a friend who we were so close with for years and years, and then kind of fell out of touch for a bit. We met for dinner and it was like time had never passed since our last visit together. It was a very full and wonderful week, full of lots of good times, laughter, friends, and just all those moments that make up life, everyday. What a terrific spring break you had with Wyatt! You did such fun things. We have a good time. 🙂 My little buddy!